Do you ever make a wish, just because? Of course, there are the somewhat standard wishing opportunities that come with birthday candles, spotting the first star at night, and seeing falling stars. Those are pretty much a given with the wish seekers. However, I find myself sending out small, in-the-moment hopes and dreams at other moments as well. For instance, when Little Bit’s and my birthday date pops up on the digital clock, I make a wish. Every time I see 1234 in a row on a digital clock, it’s wishing time. 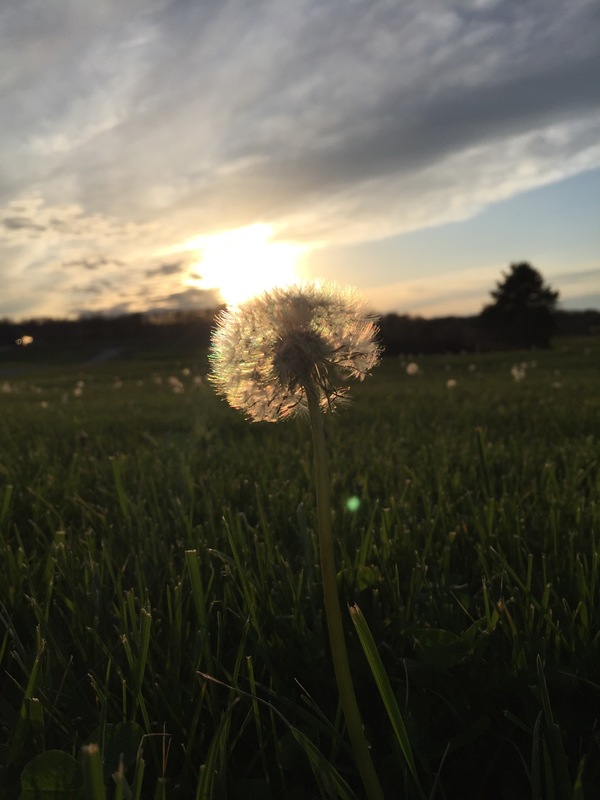 I’d have to say, our all time favorite kind of wishes are dandelion wishes. Talk about some fun! 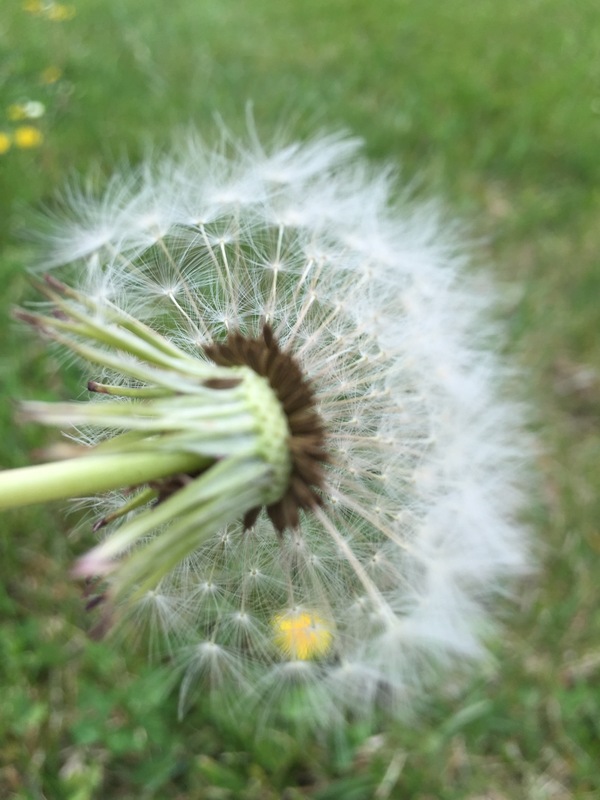 I love the idea of simply grabbing a white dandelion, taking a big breath, making a wish, and blowing those seeds out to who knows where the wind will carry them. Don’t you just love the limitless possibilities of that? It’s like being completely free to put ideas and thoughts out into the world with no fear of self doubt or judgment. Thoughts, hopes, and dreams are all packaged up in a simple flower. 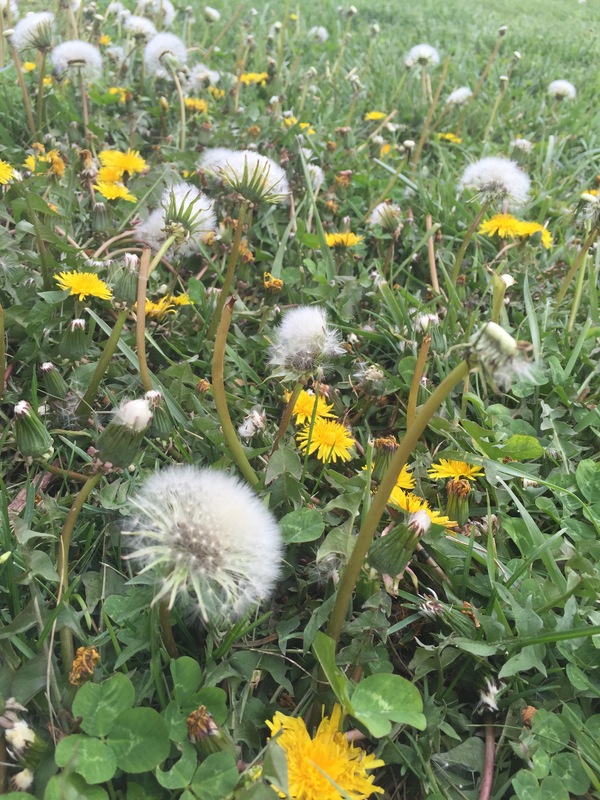 I once met a gal who said her children were not allowed to make dandelion wishes. Her reasoning? Because she didn’t want more dandelions in her yard. She said didn’t want more weeds. What??? What about running amuck across the yard, hair flying, giggles abounding, and joy radiating around the beauty of letting go and stepping into childhood for a few minutes? Hmmm. Guess I’m more of a wildflower type girl myself. Last Sunday it was a quiet day here. About mid-afternoon, I stepped outside and that’s when I saw them! Our yard was completely packed with potential wishes! Dandelions were everywhere! I sat down on the sidewalk and watched the wind whip their stems. If it’s possible for flowers to be happy, I’m pretty sure they were. Not once did I see even one try to hold still and fight the wind. Love that. In the days since, I have kept my eye on all those dandelions. In the mornings, they’re drenched with dew. In the afternoons, they seem to enjoy soaking up the sun, and when evening comes, I seem to find myself scrambling a bit, trying to get a picture so you can see what I see. Right now I’m standing in my yard with a huge smile plastered across my face. In every direction I look, dandelions are standing tall and with them are thousands of wishes… just waiting. Ha ha! Ok, I LOVE that! You’re a girl after my own heart! Wish big!!! I won’t tell him! Ha! I think dandelions get a bad rap.. They’re a pretty yellow and you can eat them too.. We don’t have to bend to society’s whims of norm !!! That’s it ! I’m growing dandelions !!! Heck yeah! My brother makes dandelion jelly. PS You just totally upped your heroism status in my eyes! Dandelions RULE!! 😊 It’s a good thing we like them, because they’re making a statement! And Dad was my hero.. he’s still my hero.. But his shinning armour got a little tarnished for a moment though little girl eyes.. 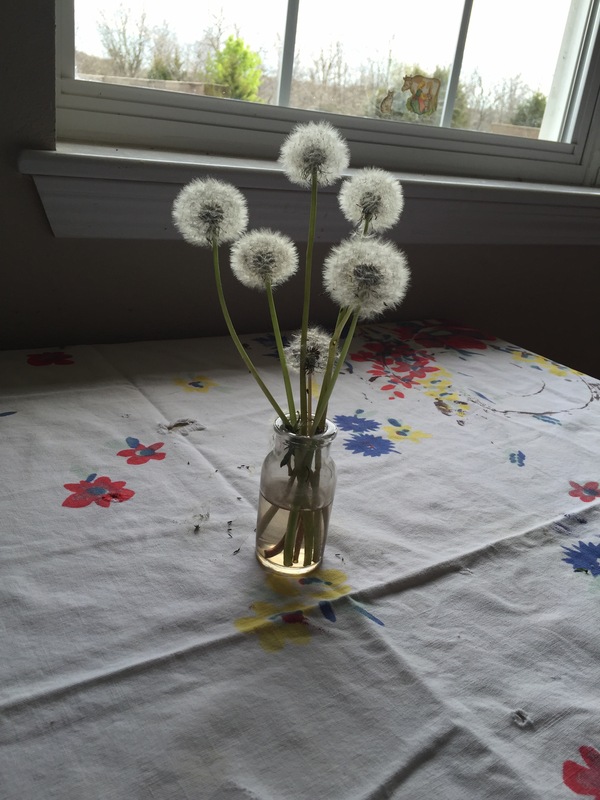 Your photos are wonderful, and will motivate me take a closer look at the dandelions the next time I go on a walk. We all did the same as children, but why stop? Let your mind go with each seed as it travels to far away lands filled with hopes of a new life and greener pastures! I will never grow up or grow tired of dreaming! I like your way of thinking! Growing up is over rated, for sure! :) PS With your description, I can just “see” those seeds floating to new places. Makes me smile! I’m praying for rain so your yard fills up with dandelions!! Ha! What a funny contradiction to a plant most consider a troublesome weed! I can just picture you picking one and making your wish. I figured you’d totally get this post. Peas in a pod! Thank you for your kind words there at the end. Tomorrow I’m going to pick handfuls and blow big wishes for your mum. And, send big kisses her way, too. I love that, swirling. Believe it or not, I totally understand that changing thing. Something’s different, but the mind takes a while to catch up and on to whatever is changing. Sometimes it seems we aren’t supposed to “get” things until it’s time, even when that time may not come exactly when we want it to. Darn ocean. :) If we were neighbors, I’d call you over and we’d sit in my yard, knee deep in wishes. Hugs to you, my friend. Big hugs. Yeah, changes are definitely afoot but you’re right, I don’t quite “get” them and maybe I’m not meant to yet. I don’t know. All I do know is that I’d love to be sitting in your yard with you right now. :-) Big hug back. Funny how we can feel when something isn’t quite right. It seems to go in stages. Sometimes I notice things are a bit off for my friends, sort of all at once. Then it seems like the Universe “rights” herself again and everything is ok.